Casa Thomas was built in 1898 by Domènech i Montaner for his cousins, who were famous printers and engravers, and has the earliest examples of his decorative ceramic appliqués – strange hybrid creatures, half-carnation, half-lizard. 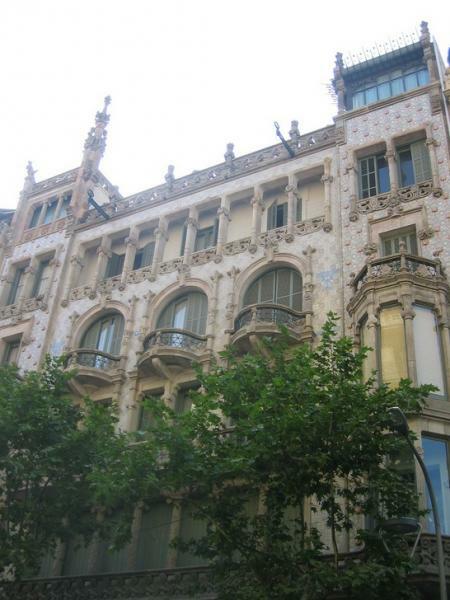 In 1912, Domènech’s son-in-law, Francesc Guàrdia i Vidal, added the three neo-Gothic floors on top as a home for the family. It once houses BD Barcelona Design, founded in 1972 by architect/designer Oscar Tusquets among others, and stocks reproductions of Gaudí’s furniture and works by Dalí, Ricard Bofill, Mariscal, Mackintosh, etc. as well as new designs by the likes of Jaime Haydon, but they've since moved to Carrer de Ramon Turró 126.